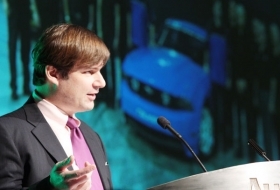 Ford marketing chief Jim Farley, shown speaking at the Automotive News World Congress on Tuesday, told an industry gathering in New Orleans, "We expect the dealers who look at the numbers and know that their viability is questionable to work with us." Nearly three years after Ford Motor Co. began actively pursuing dealership consolidation, the landscape for Ford, Lincoln and Mercury retailers is quite different. Ford finished 2008 with 3,787 domestic-brand dealerships, down 269 for the year and down 13.9 percent in the past three years. That number is on target with the 3,790 estimate that Ford gave Congress in December. The harshest toll has been on stand-alone Lincoln-Mercury dealerships. With 357 stores at the end of 2008, the number is down 42.3 percent compared with the end of 2005. During the same period, the number of Ford-Lincoln-Mercury stores rose 22.7 percent as Ford dealers have picked up Lincoln and Mercury franchises and Lincoln-Mercury dealers have picked up Ford franchises. That trend is likely to continue as Ford's dealership network continues shrinking. But Ford marketing chief Jim Farley won't say how much more room there is to cut the Lincoln-Mercury network.